From time to time I will lose an email in my inbox (please tell me that happens to you, too?) and will completely forget that I needed to do something or share something until it’s a lot later than is seemly. 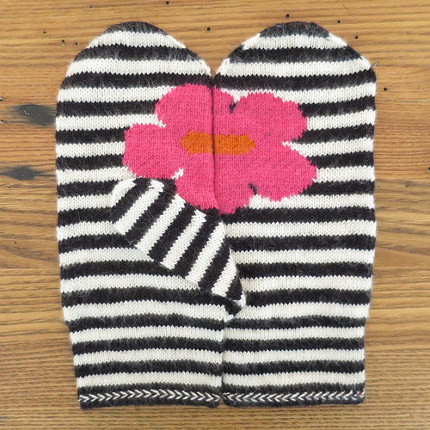 So it is with my sharing of the May Flowers Mittens, which were Kat at Just Crafty Enough’s mitten of the month for May. Yeah, like, last month. But they’re still completely adorable and you should knit them if you’re into mittens. These would be great for brightening up any dreary winter day, and the same concept would be adorable on kids’ mittens as well. These are extra fun, too, because they have a Latvian braid edging, which is not a technique that everyone has used, but it gives a nice extra detail to the cuffs. The jogless stripes are excellent, too! I happen to be knitting some mittens right now, which makes me wonder, do you knit winter things in the summer? I’d love to hear what you’re working on!